Post 2 of 2 – SNOW! So here’s the second of my posts today. I woke up with a bit of a head ache from the night before and looked out the window to this! Normally I would of stayed in bed until some stupid hour on a day off, but decided to get up and put on some ‘snow clothes’ (Jack Wills joggers, UGG boots, hat, scarf, that kind of thing) and head outside. My nephew, Michael, and Dan having a bit of a snowball fight. Me, looking a little worse for wear (this was something like 9.30am, an hour I rarely see). Michael with snow on his face, how cute!? Our masterpiece of a snowman! I only had the patience to make it that big. 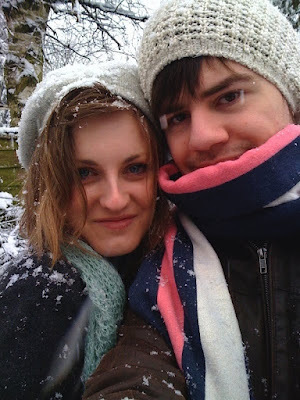 Me and Dan before he spoiled the fun by throwing a snowball slap bang in my right eye, causing my eye to sting so much I could hardly open it, and leaving my head with a lump. I had a headache for the afternoon. Unimpressed wasn’t the word. I’m okay now though, still a little sore but all is forgiven. I’m hoping there’s more snow tomorrow so I can take some polaroids! "Post 1 of 2 – Work Night Out!" Aw I love snow! Very cute photos!